Win Korg Pitchblack Poly Polyphonic Tuner! Are you forever out of tune? Fear not, for we've teamed up with the good people at Korg to give you a chance to win one of their Pitchblack Poly Polyphonic guitar tuners. All you need to do is head over to the competition page, answer a ridiculously easy question, and you'll be in with a chance to win one of five shiny new tuners we've got waiting here for the lucky winners. 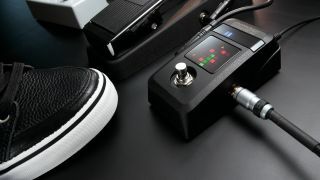 The Pitchblack is a pretty impressive little black box, featuring as it does high precision polyphonic tuning, a display that gives you the status of all strings at once, a "String Seeker" system which automatically switches the display to the string being tuned, a double meter for high visibility, and compatibility with guitars and basses. For more information about the Pitchblack Poly Polyphonic tuner, visit Korg.